Odilon Redon (1840–1916), Ophelia (1900-05), pastel on paper on cardboard, 50.5 x 67.3 cm, Private collection. Wikimedia Commons. In my first article commemorating the centenary of the death of Odilon Redon (1840–1916), I traced his early career in charcoal drawings, prints, and some landscape oil sketches. By 1895, he had largely finished working in charcoal, and started to concentrate more on oil paintings and pastels. The unusual images which he had earlier expressed in charcoal now started to appear in oil paint on canvas. In 1895, he visited London. Odilon Redon (1840–1916), Christ and the Samaritan Woman (The White Flower Bouquet) (c 1895), oil on canvas, 64.8 × 50 cm, Städelsches Kunstinstitut, Frankfurt am Main, Germany. Wikimedia Commons. Christ and the Samaritan Woman (The White Flower Bouquet) (c 1895) is a startling depiction of a popular story from the gospel of John, chapter 4, verses 4-26, in which Christ arrived at a well in Samaria, tired and thirsty after his journey. A Samaritan woman came to draw water, and Jesus asked her to give him a drink. That surprised her, as at that time most Jews would not have engaged with a Samaritan like her. They then became involved in conversation, in which Jesus preached to her, and revealed himself as the Messiah. 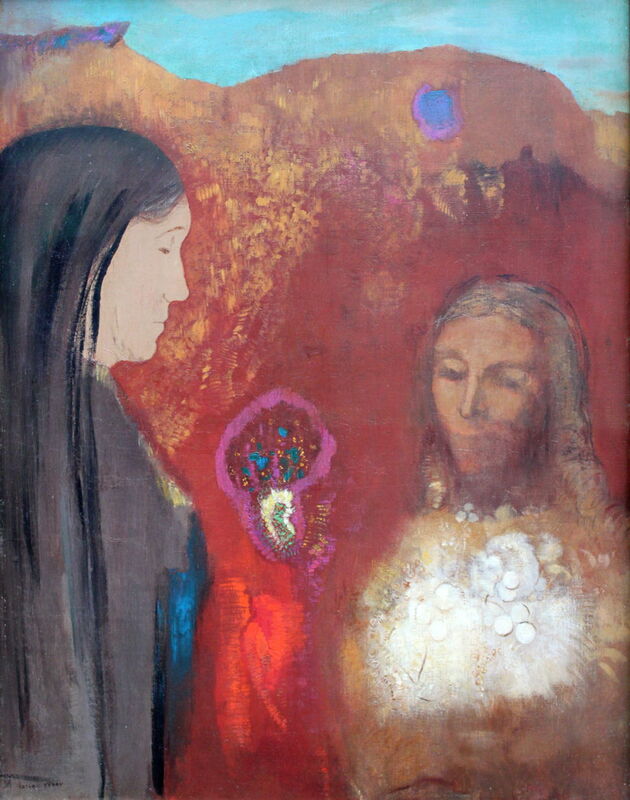 Redon offers us a unique interpretation, in which Christ appears to be holding a bouquet of white flowers for the woman. There are other adornments, such as the elaborate floral object between the two, and bright blue object high above Christ’s head. Both the figures have their eyes closed. Odilon Redon (1840–1916), Deux femmes dans un paysage (les trois couleurs) (Two Women in a Landscape, The Three Colours) (c 1895), chalk and pastel on paper, dimensions not known, Kröller-Müller Museum, Otterlo, The Netherlands. Wikimedia Commons. Deux femmes dans un paysage (les trois couleurs) (Two Women in a Landscape, The Three Colours) (c 1895) is another very unusual painting in chalk and pastel from about the same time. Two women – one apparently white, the other black – stand, their robes coloured by the tricoleur. Odilon Redon (1840–1916), Jeune Fille dans un Jardin de Fleurs (Young Girl in a Garden of Flowers) (1896-1900), lithograph, 23.9 x 30.7 cm, Museum of Fine Arts, Houston, TX. Wikimedia Commons. Jeune Fille dans un Jardin de Fleurs (Young Girl in a Garden of Flowers) (1896-1900) is one of his lithographs from this period. Set inside the outline of a head and shoulders, or perhaps a garden arch, a young woman walks amid strange and exotic flowers. 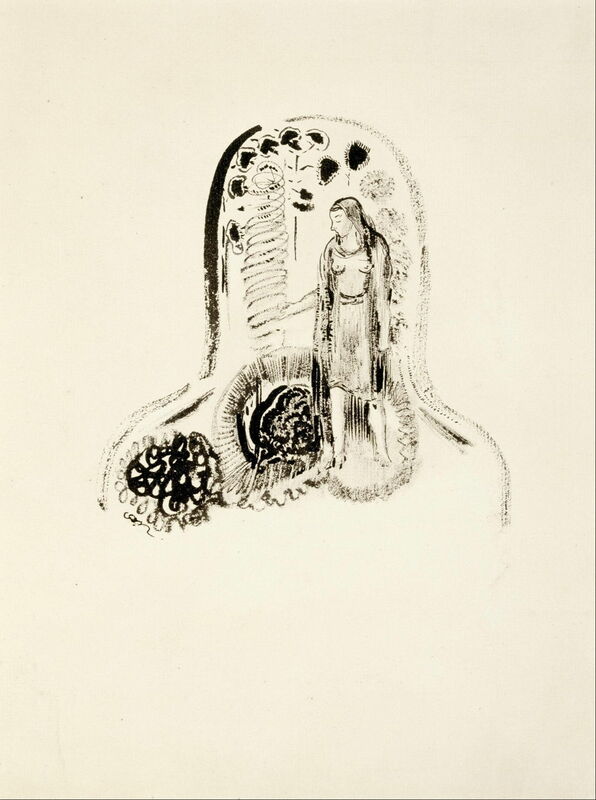 In 1899, Redon published his final collection of lithographs. 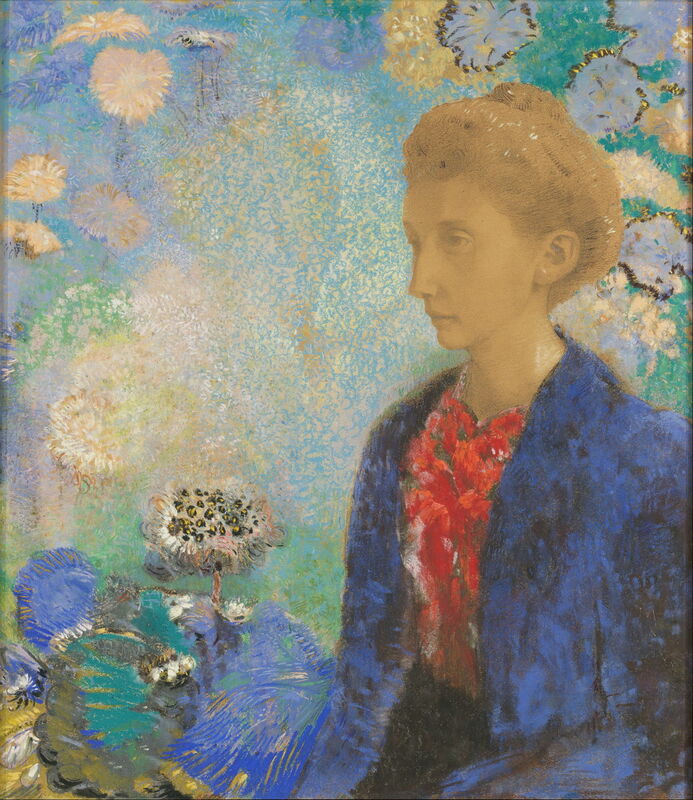 Odilon Redon (1840–1916), Baronne (Baroness) Robert de Domecy (1900), oil on canvas, 74 x 68 cm, Musée d’Orsay, Paris. Wikimedia Commons. 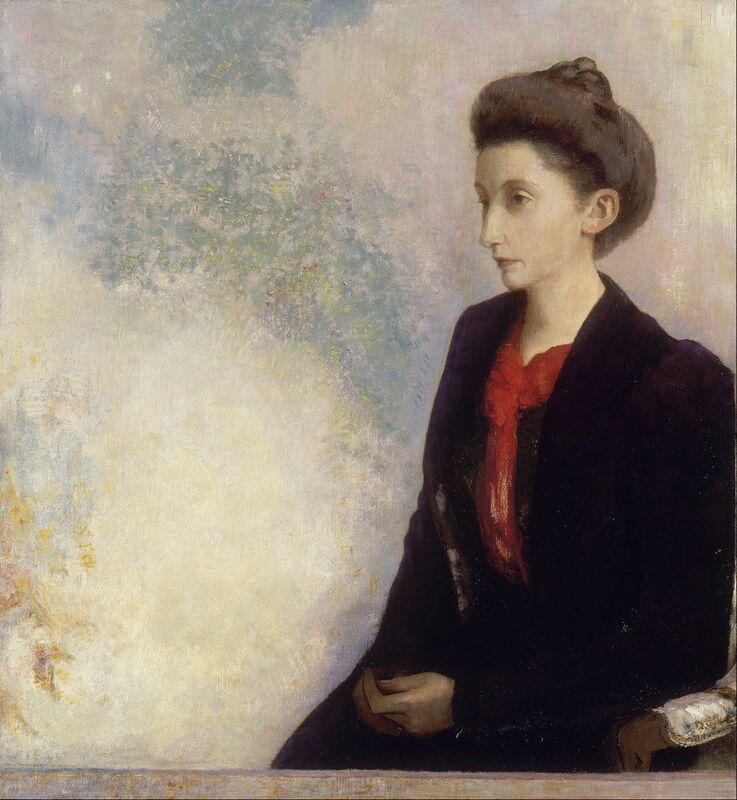 Redon also painted some relatively conventional portraits, such as this of Baronne Robert de Domecy (1900), in oils. 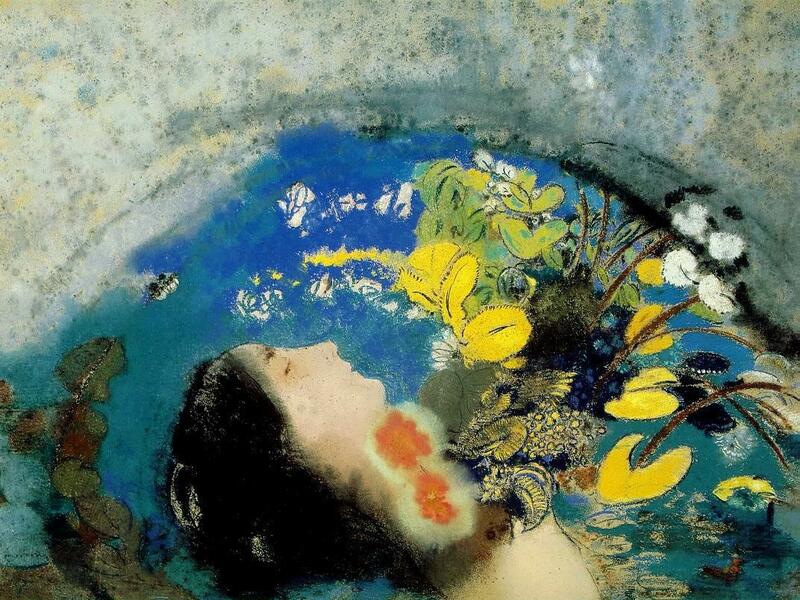 Her husband was a faithful patron to Redon. Odilon Redon (1840–1916), Baronne (Baroness) de Domecy (c 1900), pastel and graphite on light brown laid paper, 61 x 42.4 cm, J. Paul Getty Museum, Los Angeles, CA. Wikimedia Commons. For some of these, he also made more radical and imaginative pastel paintings, here Baronne de Domecy (c 1900), with its huge imaginary flowers. He was the lifelong friend of Armand Clavaud, an eminent botanist of the day, who must have found Redon’s paintings a revelation. 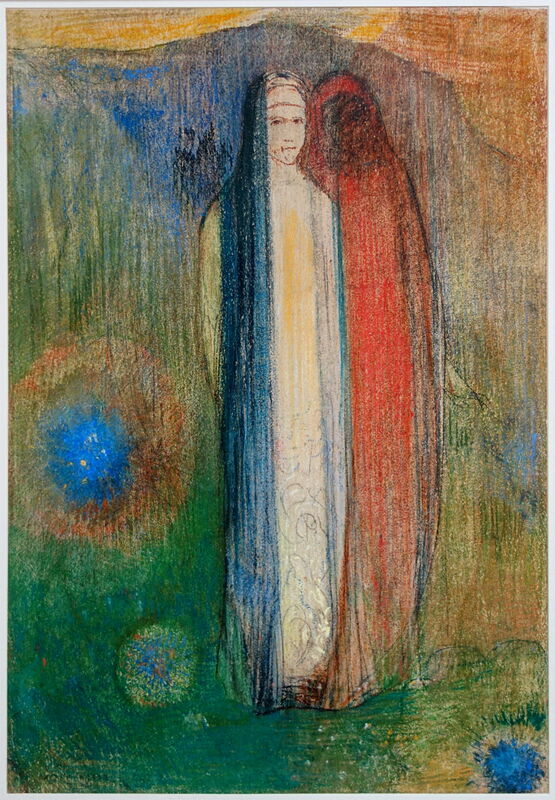 Odilon Redon (1840–1916), Profil sur méandres rouges, ? Jeanne d’Arc (Profile on Red Meanderings, ? Joan of Arc) (c 1900), pastel on paper, 52 x 36 cm, Musée d’Orsay, Paris. Image EHN & DIJ Oakley. 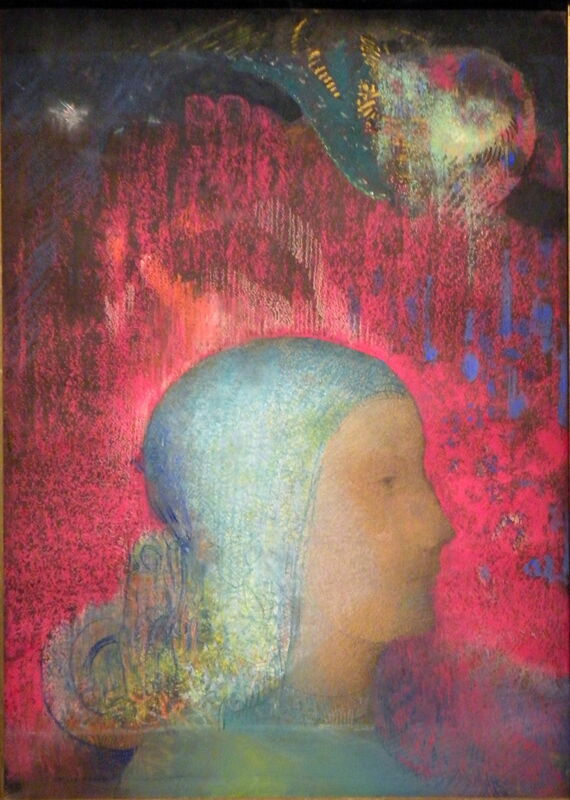 It has been proposed that Redon’s pastel Profil sur méandres rouges (Profile on Red Meanderings) (c 1900) was intended to portray Joan of Arc, the French saint and hero. 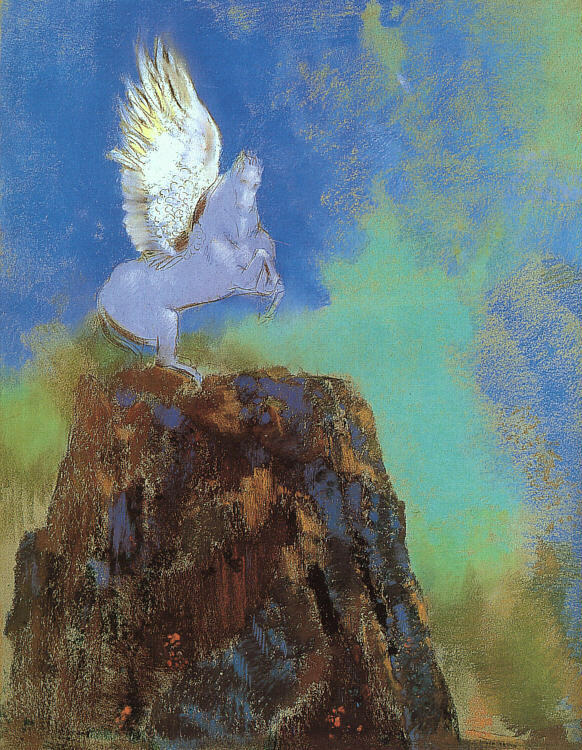 Odilon Redon (1840–1916), Pegasus (‘White Pegasus’) (1900), media and dimensions not known, Hirshhorn Museum and Sculpture Garden, Washington, DC. Wikimedia Commons. Redon painted many of the most popular stories from the classics, too. This Pegasus, often referred to as the ‘White Pegasus’, from 1900, is a superb depiction of the winged horse, but out of any narrative context. Ophelia (1900-5), a pastel of the well-known lead from Shakespeare’s tragedy Hamlet, shows her in a lily pond, presumably just after her suicide. The contrast between this and (for example) JW Waterhouse’s paintings of Ophelia from 1889-1910 could not be more stark. Odilon Redon (1840–1916), Flower Clouds (c 1903), pastel on blue-gray wove paper with multi-colored fibers, 44.5 x 54.2 cm, The Art Institute of Chicago, Chicago, IL. Wikimedia Commons. 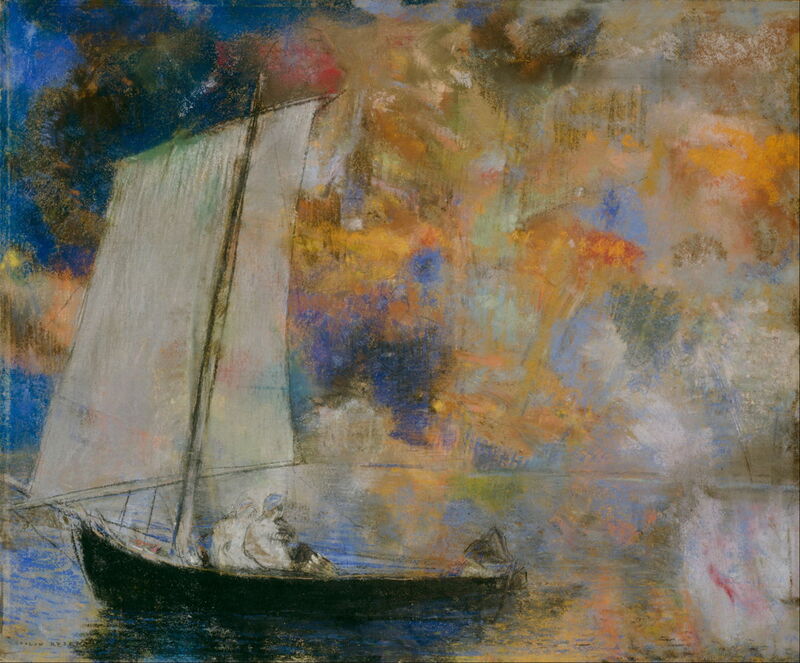 Flower Clouds (c 1903) is a pastel introducing another theme which recurs in Redon’s paintings, a sailing boat containing people. In this version, it is set against a riot of colourful flowers in the sky. In 1903, Redon was made a member of the Legion of Honour, in recognition of his art. Redon was strongly influenced by Japonisme, as were many artists in France at that time, but unusually by Asian Buddhist art too. His Buddha from 1904 sets the meditating Buddha at the foot of a great tree, into whose trunk he partly merges. Around him are more brilliantly colourful and imaginary flowers. Odilon Redon (1840–1916), Le grand vitrail (The Large Window) (1904), charcoal, pastel and stumping on cardboard, 87 x 68 cm, Musée d’Orsay, Paris. Image EHN & DIJ Oakley. 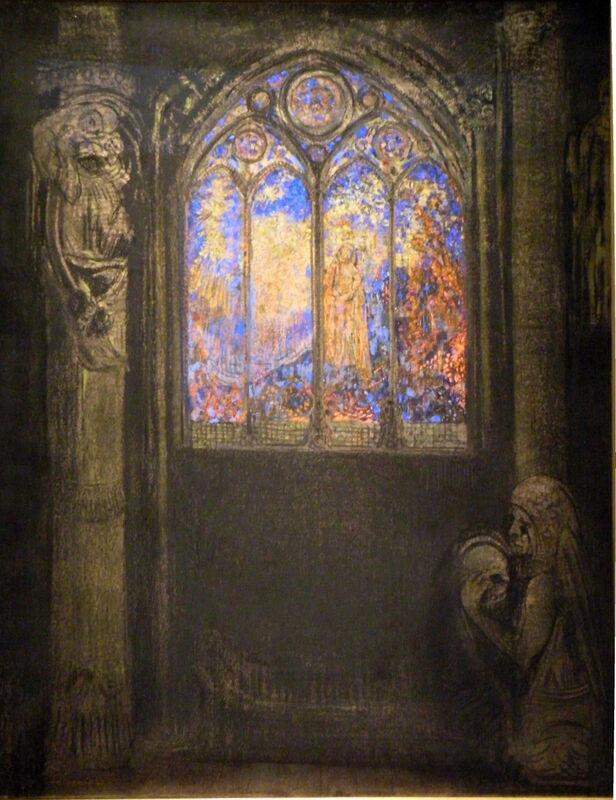 Le grand vitrail (The Large Window) (1904) is one of the most remarkable pastel paintings that I have seen. Framed by carved masonry shown in the dull greys of charcoal, a mediaeval stained glass window dazzles with its bright, rich colours. 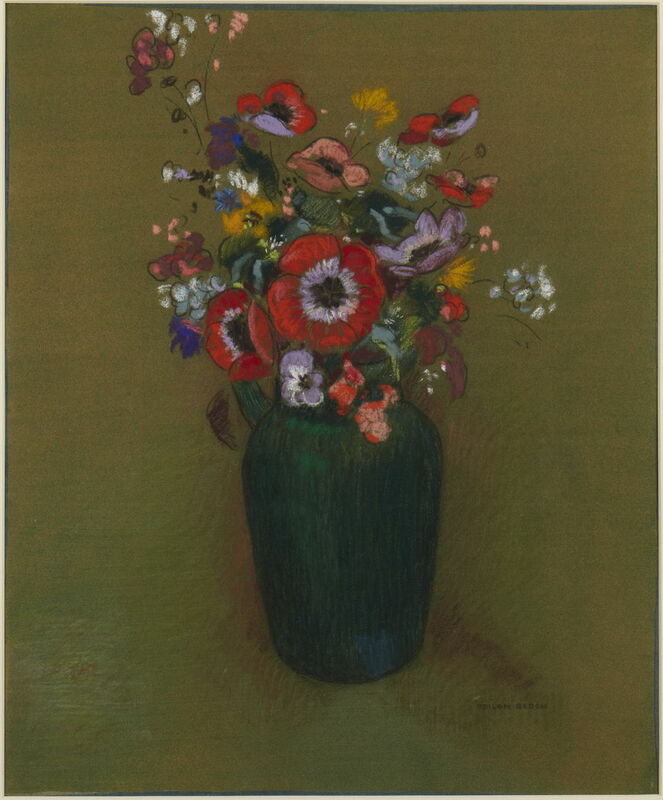 Odilon Redon (1840–1916), Vase of Flowers (c 1900-10), pastel on board, 46.2 x 38.7 cm, Princeton University Art Museum, Princeton, NJ. Wikimedia Commons. Much like the avant garde American artist Charles Demuth, Redon also painted a succession of much more conventional floral still lifes, such as his Vase of Flowers (c 1900-10). In Demuth’s case, these appeared to be therapeutic to him when he was suffering the consequences of his diabetes. I do not know why Redon painted his. 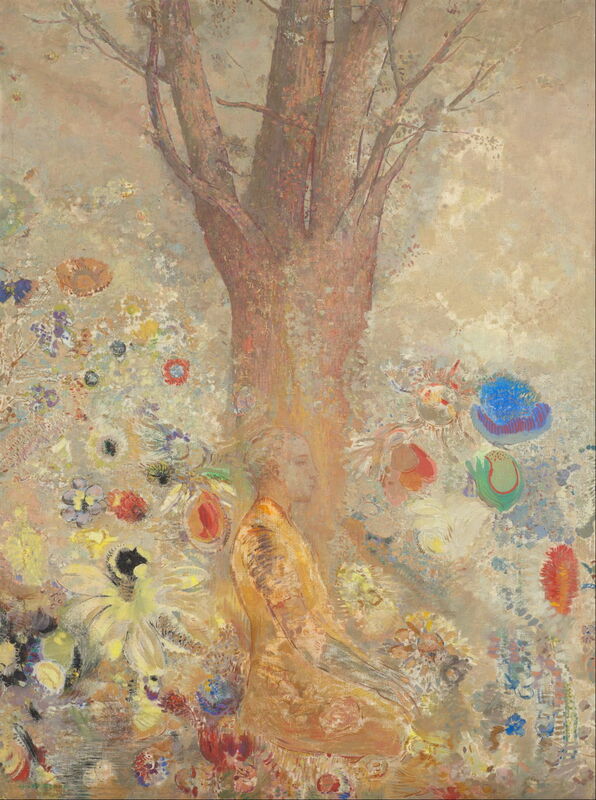 In 1904, at the Autumn Salon, a total of 62 of his works were exhibited in a room dedicated to Redon. He also had his first painting purchased by a major French public collection. Posted in General, Painting and tagged Demuth, Impressionism, painting, Post-impressionism, Redon, symbolism, Waterhouse. Bookmark the permalink. The reason Redon painted the more conventional flowers is because he was asked by a patron to do so and soon a demand was created. From what I have read they were very profitable for him and he enjoyed creating them. Thank you very much for that insight. Artists do still have to pay the bills, of course, and they’re still wonderful paintings.